In this 21st Century we all have seen, used or know about a GPS, it is a dices to help us get to our destination without getting lost. It will give you precise directions, but even more important God has a Plan of Salvation, His own GPS for our Final destination. The path set before us is clear, the directions are clear. God through His Word has given us a step-by-step guide so we will arrive in Heaven. 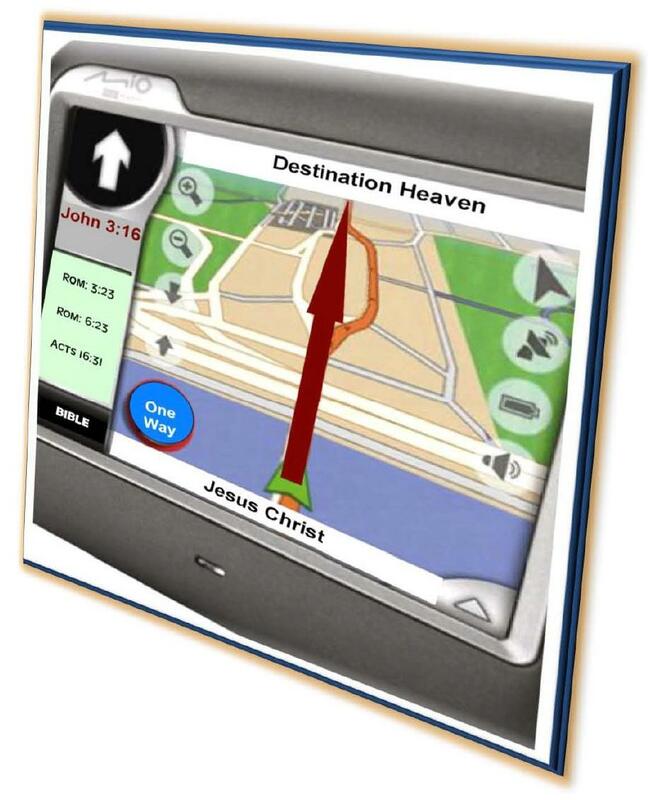 Would you like to know God’s GPS? 1. Realize that you are a sinner. In Romans 3:24 it states, “all have sinned and come short of the Glory of God.” That is correct, all have sinned, and we all need to be set free from ourselves. 2. Know that our sin comes with a price. In Romans 6:23 it tells us clearly that the “wages of sin is death”. Jesus Christ paid that price for us on the cross; it is a debt we could not pay in our own strength, goodness or even in our kindness. Salvation is a gift from God through His Son, Jesus Christ. 3. Therefore, we must acknowledge that Jesus Christ died for our sins. In Romans 5:8 we are reminded that even while we were in our sin and while we were sinners, Christ died for us. Through the Cross God proved His love for us by sending His Son, Jesus Christ, to die on the cross for us. He loves us that much. 4. In Acts 16:31, we are commanded to “believe on the Lord Jesus Christ and we will be saved” that is we trust, and rely on Him to save us from an eternal death in hell to an eternal life in Heaven. It is simple act of faith, God desires that all will be saved (John 3:16). Believe today that Jesus Christ paid a price for your salvation, died and rose again to conqueror the grave, He is alive and He wants to guide, direct us. Will you honor and accept Him as Savior and Lord today? I know that I am a sinner and that You died to pay the price for all of my sins. The best I know how, I repent of my sins, and I am asking You to come into my life to save me and give a new and eternal life through You. In Jesus name, Amen.